Distributed by Selig Polyscope Co. It is likely a rare soul who would have heard of "Sweet Alyssum" prior to Grapevine's release of the DVD; however, it is a good film and one that silent film fans will find a welcome addition to the titles available for the home movie market. The stars are certainly recognizable - Tyrone Power, Sr., Kathlyn Williams and Wheeler Oakman - and the story is powerful. For the most part, it has the look and feel of a 1915 film; that is, there are indoor scenes that are obviously sunlit, and on a least one occasion, the breeze moves clothing about although the action takes place indoors. But don't let that deter you. Selig provided a first-rate production with excellent acting and plenty of dramatic appeal. Roanoke Brooks is a night watchman at the local factory and is a loving husband to his wife, Daisy, and a doting father to his small daughter, Alyssum. Daisy wants new clothes, but Roanoke asks her to remember they are saving for Alyssum's education. Brooks' boss, Garlan, is attracted to Daisy, and soon an affair is underway. The affair ends in tragedy, and Brooks and Daisy move to the country. Eighteen years later, we see Garlan's son, Wynne, as a bank teller. His fellow bank teller is having an affair with Wynne's wife, and the two "set up" Wynne as an embezzler of the bank's money. Wynne escapes to the country, changes his name, and marries Alyssum - although Brooks does not realize he is Garlan's son. This, added to the fact that Wynne's past comes back to haunt him, makes for an engrossing tale. Of course, Tryone Power is the star of the picture, and he gives a powerful performance. Without giving away too much of the plot, let's just say his outstanding sequence takes place when he learns of his wife's infidelity and goes after her and her lover, who is also his boss. Power's powerful build, along with his unruly hair and blazing eyes, makes him an imposing presence. 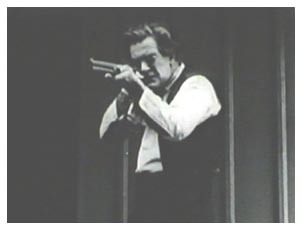 The intensity of his performance is right on target - displaying uncontrollable anger as one would expect in a situation such as this, but not overacting the part, either. The next best scene for Power takes place when he discovers Oakman is not only the son of the man who ruined his marriage, but also an accused embezzler and bigamist. His anger rises to the top again, and he gets his gun to shoot the "scoundrel" - stopped only by his daughter and grandchild. Much of the second half of the movie belongs to Wheeler Oakman and Edith Johnson as the grown-up Alyssum. Wynne, who has changed his name to John Wyatt, comes to the country village as the new schoolmaster. Conveniently for the development of a love affair, he boards in Brooks' home. Alyssum's pursuit of the reluctant Wynne is charming - and this, along with the rural setting, reminds one of a D.W. Griffith film. Wynne's dilemma is evident when one day after school, he sits alone at his desk, elbow on the desktop and head leaning against his hand, thinking. We see a flashback to his first day of school. As he is leaving, Alyssum comes outside and hands him a basket with his lunch. The two have not expressed their fondness for each other at this point, but the longing looks and loving gazes make it apparent. Then we see Wynne's thoughts return to his spiteful wife who showed no sympathy when he came home to tell her he was being falsely accused of embezzlement. Instead, she declares that he must be guilty. So, as a married man, he realizes he can't allow his emotions to outweigh reason no matter what his feelings for Alyssum may be. "Hadn't we better tell daddy?" Later, when the two are in a well-photographed bucolic setting, he can't resist kissing her. The innocence of the period in which this film was made is evident by Alyssum's response to a first kiss, which is, "Hadn't we better tell daddy?" Of course, Wynne wishes he were able to make such an announcement, but he knows his only response at this time must be, "I'll ask him for you someday, 'Lissem, but not just now." As noted earlier, the story is an engrossing one, particularly when things begin to "heat up" for Wynne. He is married, has a baby, and it appears the divorce he thought he had has not taken place - and he has been identified as he bank embezzler. The resolution - which we won't reveal here - is rather simple and, therefore, not completely satisfying, but all ends well, and that's the way we like to see our stories come to a close. The one significant criticism that viewers may find in the film is when Alyssum is willing to sacrifice her baby's life to save her husband. Certainly a dramatic scene, but greatly disconcerting as we see Brooks attempt to shoot Wynne and Alyssum place the baby in the line of fire. Power is excellent, and, as we pointed out, he really shines in the early part of the film when he discovers his wife's infidelity. Power's greatest popularity was in the teens when he was a much-sought after leading man. His first movie role came in 1914 when he was already in his mid-forties. He continued to be very busy during the twenties with nearly 30 films to his credit, but - as one would expect at his age - he was essentially relegated to character roles. Of course, Power's greatest claim to fame is being the father of Tyrone Power Jr., the handsome leading man of the 1930's, 1940's and 1950's. Power Sr. died in 1931 of a heart attack. Kathlyn Williams, as the unfaithful wife, does a superb job; however, one is surprised to see this major star playing such a distasteful role, a somewhat risqué topic when considered in the context of the 1910's. The Moving Picture World reviewer felt the portrayal inappropriate noting, " . . . somehow we could not quite get away from that unwholesome mother, and felt that one reel might have been censored." (3) She was one of Selig's most popular stars until the studio folded, but moved to Paramount appearing in some of Cecil B. DeMille's films and then moving to more matronly-type roles throughout the 1920's. She retired from films in 1935. After losing a leg in a 1949 car accident, she was wheelchair-bound up until her death in 1960. Wheeler Oakman deserves great credit for underplaying his role in "Sweet Alyssum," thereby eliciting sympathy for this low-key, mild-mannered guy. Most silent movie fans today may know him best from his role in the "Outside the Law" (1920) as Priscilla Dean's partner in crime. Although the film is of particular interest today because of Lon Chaney's fine performance in it, "Outside the Law" was strictly a starring vehicle for Dean, who was married to Oakman for several years. Oakman began in films in 1912 and was consistently active up until his death in 1949, never as a major star, but certainly a presence in both the silent and sounds eras. Edith Johnson is cute and perky as Alyssum. With her beauty only hampered by the typical dry, fly-away hair that was common during this period, she make a very lovely Alyssum nonetheless. She was born in Rochester, NY, which was fortunate in that she became "The Kodak Girl" as a teenager, appearing on numerous magazine covers and in Kodak advertisements. This led to a movie career that lasted from 1913 to 1924 when she chose to retire from films. She had married actor William Duncan several years earlier, and they remained together until his death in 1961. She passed away in 1969. The quality of Grapevine's print is good, not excellent, yet has very little contrast issues, but scratches and lines are apparent much of the running time. Nevertheless, the film quality is easy on the eyes, even when viewed on a large screen. The David Knudtson organ score is a plus and well-done. 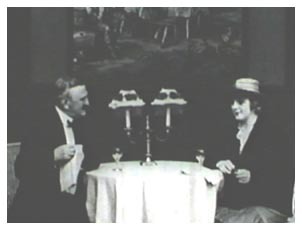 At 59 minutes, the film appears to be complete, especially when one considers it is listed at five reels in the American Film Institute Catalog of Feature Films 1911-1920. 1. "Colin Campbell." Internet Movie Database. 2. Spehr, Paul.C. "Colin Campbell." American Film Personnel and Company Credits, 1908-1920. McFarland & Company, Inc., Publishers. 1996. 3. "Sweet Alyssum" review. Motion Picture World. December 4, 1915. 4. Slide, Anthony. "Selig Polyscope Company." The New Historical Dictionary of the American Film Industry. The Scarecrow Press, Inc. 2001.